What strikes me the most about the recent credit market crisis is how fast the world is trying to go hack to business as usual. In my view, the crisis wasn’t an accident. We didn’t get unlucky. The crisis came because there have been a lot of bad practices and a lot of bad ideas. Securitization is a mediocre idea. Re-securitization of already securitized assets into a CDO is a bad idea. Re-securitization of CDOs into CDO-squared is a really bad idea. So is funding a pool of long-term illiquid assets with very short-term funding in the so called asset backed commercial paper market. And as I will get to in a moment, it is a horrendous idea to delegate most of the responsibility for assessing credit risk to a group of credit rating agencies paid for by the issuers rather than the buyers of bonds. This crisis came for exactly the right reason. There is a big flaw in the structure of our credit markets. The bad structure induced lenders to take imprudent risks and make imprudent loans, which, of course led to losses. What is unique about this crisis compared to others is that the losses are in illiquid, opaque structures scattered around the world. Why should anyone be surprised? We got what we deserved. Last Saturday’s Wall Street Journal reported that the big fear that the US Treasury Department is working to avoid is, “the danger that dozens of huge bank-affiliated funds will be forced to unload billions of dollars in mortgage-backed securities and other assets, driving down their prices in a fire sale. That could force big write-offs by banks, brokerages and hedge funds that own similar investments and would have to mark them down to the new, lower market prices.” So the fear is that the new prices are actually disclosed. This is the “don’t ask-don’t tell” method of security valuation. In my view, the credit issues aren’t just about subprime. Subprime is what the media says. Subprime is what parts of our financial establishment say. Subprime is about them — those people and the people who made foolish loans to them. The word “Subprime” is pejorative. Subprime is not about us, for we are not subprime. How convenient to be able to pass the blame. There has been much talk from politicians and pundits about predatory lending –that is making loans at high rates to people who couldn’t reasonably be expected to pay them back. They are right, that is a bad practice, but that is not what’s shaking the markets. At issue today is that lenders of all sorts have lent too much money and did not demand enough interest to compensate them for the risks they took. There has been a colossal undercharging for credit across the board. I believe the poor lending standards and the low cost of credit in subprime extend throughout the credit markets into all areas of residential real estate, commercial real estate and the corporate lending markets. Let’s start with the U.S. housing market. In addition to under-priced subprime loans, we have home equity loans to prime borrowers. We now see that when house prices fall — and they are falling — from a creditor’s perspective, a second lien is not much better than a credit card receivable, though the interest received is much less. Structures backed by Alt-A loans with no documentation are performing just as poorly as subprime structures, due to the lower amount of over collateralization embedded in those deals. In commercial real estate, we read a few weeks ago about Macklowe, who purchased several buildings from Blackstone with a one-year bridge financing supporting a capital structure that was designed to be negative cash flow for the first five years. Last year Met Life sold Stuyvesant Village to an investor group for about thirty-five times free cash flow. Why were the buyers willing to pay so much? Because lenders were willing to lend over thirty times cash flow at low rates. While this was a large deal, it was by no means exceptional. These are loans based on the borrowers’ ability to refinance rather than the borrowers’ ability to repay. This is no different from 2-year ARMs in the residential market, except we haven’t yet reached the loss period when the music stops. The same has been true in corporate lending. Very low debt spreads and weak lending terms have fueled the leveraged buyout boom. With lower interest rates, a private equity owner can service more debt. More debt means winning more deals at higher prices. Blackstone has said that the benefits of the favorable debt financing have been passed on to the sellers of companies. Many of the loans were “covenant-lite” loans, where practically the only thing that could cause a default would be a missed payment. Some loans were “PIK-toggle” giving lenders the option of deferring payments. Put these together, and it becomes almost impossible to default quickly. The lenders actually convinced themselves this was a good thing — no early defaults mean a good bonus. I believe the “covenant-lite” and “PIK toggle” terms are quite parallel to the now criticized “no-doc” and “pay-option” terms that everyone agrees were ill conceived in the residential market. In all of these areas, lenders have taken on too much risk for too little compensation. There is not enough spread to absorb any material up tick in losses. The only difference between these areas and subprime residential is that we haven’t seen the losses yet. Why have so many borrowers of all sorts been so undercharged for risk? The short answer is “securitization” or more broadly “structured finance.” Advocates of securitization say it disperses risk. However, it does so by separating the loan originator from the eventual outcome of the loan. The originator gets a fee up front. The risk is held somewhere down the line in an alphabet soup of structured vehicles called CDOs, CMBS or CLO — not to mention CDO2, SIVs, SIV-lites et cetera. Why would anyone blindly lend to an opaque structure full of loans or pieces of pools of loans that they didn’t underwrite or even evaluate? Because the structures come with credit ratings from Standard & Poor’s, Moody’s and Fitch. Have the rating agencies developed an expertise in analyzing these structures? Perhaps, but more pertinent, they are the only ones who can evaluate them, because they are the only ones with the detailed information about the structures. The underwriters give the rating agencies much more information than is contained in the prospectus. In their evaluation of corporate credits, rating agencies are exempt from regulation FD. This means that they can receive confidential information not available to other market participants. This is kind of like a confessional where the priest delivers a public opinion on the extent of your virtues or sins — and your spouse has to guess what a AAA or BBB means about your fidelity. In the recent crisis, the rating agencies say they shouldn’t be held accountable for their opinions because they are, with apologies to my wife, nothing more than journalists engaged in free speech. What would it be called if you paid a leading publication to do a story on you and you could pull it before press, if it were unflattering. Funny, that is not free speech but is ‘for-profit speech.’ According to the rating agency party line, if people disagree, they are free to ignore the ratings. However, a credit rating is not an ordinary opinion. It is a “special” opinion — an insider opinion, because it is based on a different information set. I can’t replicate a rating analysis, because I am not privy to the information. Therefore, I am not on equal footing to be able to decide whether I agree or disagree with a rating agency. Since they know more than I do, the presumption has to be to agree. The rating agencies are structurally set up to have “insider opinions.” They just don’t want legal liability for having issued conflicted and flawed insider opinions. Incidentally, this lack of information has made it harder for the market to find a clearing price for distressed pieces of structured deals. Without enough information in the market — other than a credit rating — it is hard for informed buyers and sellers to know what to do, once the credit rating comes into doubt. One clear improvement to the current structure of the debt markets would be to insist that all information shared with rating agencies be shared with the whole market; the rating agencies should lose their exemption from Regulation FD. When Regulation FD was implemented many worried that if equity analysts didn’t have special access, the stock markets would become less stable. That hasn’t proved out. The credit markets should take the same step. More information broadly disseminated makes for a more efficient market. lf you read Moody’s investor presentation you will see that the reason to buy Moody’s stock is to participate in the growth of structured finance. Moody’s business is to support that growth and Moody’s shareholders depend on this. This conflict has caused a great deal of ratings grade inflation in structured finance. Consider municipal bonds. According to S&P’s long-term data the 10 year default rate on an A rated municipal bond is 1%; while a corporate bond’s default rate is 1 .8%; and a CDO’s is 2.7%. An A rated muni has the same chance of default as a AA/AA- rated corporate and a AA+ rated CDO. When municipal bonds default the expected recovery rate is 90% compared to 50% on corporates and CDOs. Without much fanfare the rating agencies abandoned this practice of AAA meaning AAA and BBB meaning BBB. Instead for each type of bond, they use a different rating scale with different so-called “idealized default rates” for each rating. The idealized default rate for a municipal bond at a given rating is less than the idealized default rate for a corporate bond, which is less than the idealized default rate for an asset backed security which is less than the idealized default rate for a CDO. As an example of the lack of soundness in this system, Nomura securities pointed out that hypothetically, if you took a AA+ rated asset backed security and repackaged it all by itself and called the repackaged instrument a CDO, it becomes AAA, because the CDO has a higher idealized default rate than the asset backed security. When a municipal bond is put into a CDO, for modeling purposes the rating agencies ascribe a higher rating to the muni to adjust for the fact that the muni is under-rated in the first place. Maybe everyone knows this, but it was news to me, when I learned it a few weeks ago. I might not be the only one who didn’t know. Is it a coincidence that rating agencies charge more to rate bonds in the more lenient categories? Moody’s recently wrote a report saying that if States were evaluated on the corporate scale, 49 of them would be rated AAA Moody’s noted the 10-year cumulative default rate for all investment grade Moody’s-rated municipal bonds, including bonds one notch above junk, is about half the rate for AAA rated corporate bonds. If municipal bonds are much safer than their ratings imply, it means that all kinds of states, cities and towns — effectively taxpayers of all sorts — are systemically overcharged for borrowing. The municipal bond market is $2.5 trillion. If the average municipality pays twenty basis points more for its interest because the bonds are under-rated, this scheme is costing taxpayers $5 billion per year. The misrating of municipal bonds directly benefits the friends of the rating agencies on Wall Street, the banks who underwrite the deals. A lower rating — means bigger underwriting fees. Or alternatively, the excess cost can be shared with another great friend — I mean very large customer — of the rating agencies — the municipal bond insurers who effectively rebate some of the “overcharge” to the municipalities in exchange for a share of the savings through a scheme called “bond insurance.” The municipalities purchase bond insurance to enhance their credits to the AAA level. Of course, since they are in fact, AAA to begin with, the insurance provides no true benefit. I assure you that a quick peek at the balance sheets of any of these so-called AAA rated bond insurers will tell you that they are not likely to be there to pay more than a fraction of the claims they have insured in an environment where there are wide-scale defaults in the municipal bond sector. To take a big problem and make it bigger, the new BASEL II standards for international banks that we are about to implement in the US, tie the regulatory capital requirements to the credit ratings. I don’t believe these standards give distinction to the good A rated paper versus the bad. This should broaden ratings arbitrage opportunities at the potential expense of distorting the regulatory calculations designed to ensure the safety and soundness of our banking system. Coming back to the grade inflation in structured finance — in my opinion, the rating agencies are not in a position to blow the whistle, even if they wanted to because the conflict of interest is too great. In July, Moody’s publicly complained that by tightening its rating standards it had lost share in CMBS transactions. According to Moody’s managing director Tad Philipp, “It is those deals which we seek to differentiate through higher credit enhancement that we are least likely to be asked to rate.” He explained, “I guess this is sort of like no good deed goes unpunished.” Moody’s stock fell 2% that day. The various entities that enable structured finance direct so much business to the rating agencies that the agencies can’t risk alienating them. If Pocatello, Idaho doesn’t like its rating, it has no leverage with Fitch. Wall Street is a different story. Rating agencies say hedge funds cause systemic risk. Funny, I think rating agencies are facilitating an even bigger systemic risk. It can be hard to value certain securities in times of distress. The latest hedge fund getting bad press is Ellington management, a large participant in the mortgage business. A couple of weeks ago, it suspended redemptions from its funds because it could not determine the value of its assets. Apparently they own what I’d call 20/90 bonds. 20-bid and 90-offered. While Ellington made negative headlines for doing the right thing, acknowledging it is unfair to let people in or out in such circumstance, does anyone believe that the large mortgage players like Bear Stearns and Lehman Brothers don’t also have large portfolios of 20/90 bonds? When they reported their quarterly results, investors marveled at their risk controls. However, Lehman moved about $9 billion of mortgage securities into a special classification called Level 3 under FASB 157, which gives them more valuation discretion. Both Lehman and Bear claimed their Level 3 portfolios actually had gains in the quarter, so it looks like they put the 20/90 bonds closer to 90 or perhaps even 95. This appears to be a classic example of a hedge fund being vilified for doing the right thing, while others are cheered for doing the opposite. The rating agencies have lost the ability to impose discipline on the balance sheet of the broker-dealers and the financial guarantee companies — the enablers of structured finance that bring so much business to the rating agencies. This creates an enormous systemic risk, as these entities are able to maintain access to cheap credit while overextending themselves beyond prudence. One day, taxpayers may have to pay, should the government determine than an over-levered leader is too big to fail at the point it reaches the cusp of doing just that. As the rating agencies have lost control, these companies have expanded their on and off balance sheet leverage over time with no apparent negative impact on their ratings. My friend, Bill Ackman, showed me MBIA’s balance sheet from 1990 which actually looked like a AAA balance sheet. Today’s balance sheet looks, well… different from that. Equity was 46% of assets in 1990 compared to only about 16% of assets today. Yet, it is still triple A. The rating agencies offer branded products. Their best brand is AAA. People buy AAA because they don’t want credit risk. There was a big fuss over Enron. Enron was BBB. BBB rated entities default from time to time. AAA ratings don’t — or at least they didn’t. Now, we are set for an unprecedented spate of originally AAA rated bond defaults. In my judgment, the effects of grade inflation will eventually ruin the brand values of the rating agencies. It is plain that the States and Cities and Towns in this country are triple A credits without triple A ratings and the financial guarantee companies have triple A ratings without being triple A credits. When ratings agencies are more concerned about the effects of the rating actions than on the accuracy of the ratings, they become part of the Wall Street “confidence” machine and surrender their ability to fulfill their statutory role in objectively analyzing credit. One would think that the lesson here would be to get rid of the bad practices. We should be asking ourselves what role, if any, should there be for credit rating agencies? If there is a role, should the rating agencies lose their exemption to Reg FD so that outsiders can truly do their own credit analyses on equal footing, when they don’t trust the rating agencies? To the extent that we are going to have credit ratings, shouldn’t all credits be evaluated on a single scale? And should ratings agencies be paid by the users of the ratings, rather than by the issuers? Some have questioned whether we would lose the benefit of public ratings and doubted there would be enough business for the rating agencies, if we eliminated the issuer pays system. First, I believe we could mandate the public disclosure of ratings and allow the agencies to profit by selling the more detailed research to subscribers. There are existing firms like Egan-Jones selling credit analysis on this model; however, such a change would likely have an impact on the profitability of the rating agencies. For example, Moody’s has an operating profit of 54% of sales. This ranks it 5th in the entire S&P 500. It is able to have these margins because of the current system. If you change the system, the margins will fall. Certainly, the rating agencies will fight very hard on this issue and try to scare people. However, there is a very big gap between 54% margins and not having rating agencies. If they lost the issuer pays structure, they would hardly say “Oh well, let’s go home, then.” They would have to adapt and they would persist in business. The margins would be less, but the capital markets would be much better served. A couple months ago, I thought CDO’s would go into the bad financial ideas Hall of Fame next to portfolio insurance, which exacerbated the crash in 1987. Today, I am not so sure. Certainly the buyers of bonds, the losers in the current arrangement will have a say in some of this. But the Wall Street machine is a loud one, the credit rating agencies are entrenched and the current powers in Washington don’t want to see anyone lose money on their watch. What doesn’t surprise me is that many holders of the bad paper are in no rush to mark them down to fair value and that Washington is willing to aid their efforts to sweep the problems under the rug. It is very important to many banks and broker-dealers that ‘we maintain a “Don’t ask — Don’t tell” policy of price discovery for troubled debt instruments. I have watched valuation treatment by public companies in a smaller, but telling way for the last several years. 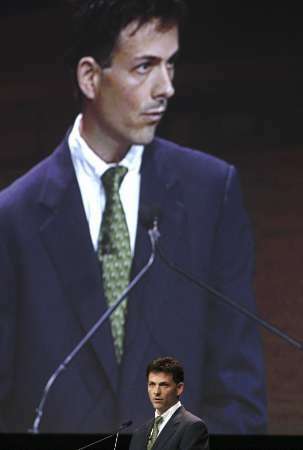 In May 2002, 1 was invited to make a speech at the Ira Sohn research conference to benefit the Tomorrows Children’s Fund to support the children’s cancer center in Hackensack. It was the first time I was invited to give a public speech. I was asked to speak about an idea. I picked, what I thought to be the best and most interesting idea in my portfolio at the time, which was to sell short Allied Capital. The gist of my speech was that Allied Capital had swept its own bad loans from the 1999-2002 corporate credit crisis under the rug and refused to mark them down to fair value. I believed it mismarked its portfolio. By the time I gave my speech about Allied Capital, it was late in the afternoon. The market had closed for trading. The next day, Allied’s stock was unable to open when the market did. There were too many sell orders for the New York Stock Exchange specialist to balance them on time. When the shares did trade, they opened down 20%. But the steep decline that day was nothing compared to the plunge I was about to take, spending years uncovering what I view as a fathomless fraud. As some of you may know, this is an ongoing saga. Allied fought back hard. Over time, I discovered Allied’s wrongdoing was much deeper than I initially imagined and extended as far as bilking U.S. taxpayers out of tens, if not, hundreds of millions of dollars by underwriting fraudulent government backed loans through its Business Loan Express subsidiary. I believe the media, Wall Street analysts, the board of directors, the accountants, the SEC, prosecutors and other government agencies have completely fallen down on their jobs to police Allied’s management. For the purpose of today’s talk, let’s just assume that I was right…that Allied did have improper accounting and then went out of bounds in an intimidating shoot the messenger campaign to silence and smear its critics and distract folks from its own misconduct by among other things screaming market manipulation and even hiring private investigators to illegally steal the telephone records and gosh knows what else about its critics. Instead of investigating my allegations of Allied’s improper accounting, regulators first decided to investigate Allied’s claims that my speech was an attempt to manipulate the market. As Allied persists in its misbehavior without consequence — in fact, its shares have since recovered from the initial fall after my speech — it raises the question: if someone commits fraud, but no one has yet lost money and the regulators decide to ignore it, was it really fraud? The authorities are good at “cleaning up” fraud after the money’s gone. After a blow-up, with investors’ capital already lost, they know just what to do. If the blow-up is big enough, like Enron, they form a special “task-force” and pursue criminal cases against the insiders. The authorities really don’t know what to do about fraud when they discover it in progress. The Arthur Andersen prosecution, which put the audit firm out of business for bungling Enron, cost a lot of innocent people their jobs. The government doesn’t want that to happen again. It seems that the regulatory thinking, espoused by SEC Chairman Christopher Cox is that shareholders should not he punished for corporate fraud, because he believes they are the victims in the first place. Why punish the victims a second time? This thinking may be politically expedient in the short term, but creates a classic “moral hazard.” If regulators insulate shareholders from the penalties of investing in corrupt companies, then investors have no incentive to demand honest behavior or avoid investing in dishonest companies. The truth is that investors in corporate securities are risk takers making investments of risk capital. One risk is fraud. The best way to encourage fraud avoidance is to make the penalties for fraud sufficiently high. If investors believe that companies making false and misleading statements will be punished, they will be more sensitive to what is said. Their money is at stake. Passing laws like Sarbanes-Oxley helps honest companies create better controls. It does nothing to stop top-down corporate fraud, unless it is enforced. For our markets to work effectively, participants need to follow the rules and when they stray, there need to be serious consequences. If Sarbanes-Oxley is to be effective and taken seriously, the SEC can’t let behavior like Allied’s pass without prosecution. To tell the whole story would take me far more than the time we have together this morning. In fact, it would take a book. It is a story worth telling. So much so, I have written a book on the whole experience. It is called “Fooling Some of the People All of the Time” and will hit the bookstores next spring. Before going on to questions, I thought I would read you an excerpt from the book so you can get a flavor as to what you might find at Barnes & Noble next year. EXEL: The Next Killer Stock? Are You Going "All-In" On Gold And Silver, Yet? Going All In On Silver And Gold? Benjamin Graham: Your Biggest Enemy? No emails gathered of users at our website shall be revealed, sold or rented to a third party at any time, now and forever. Additionally, we do not spam our readers. We also have no access to customers' credit card account numbers; only third party merchants Clickbank and Paypal has that information. Disclaimer: The content on this site is provided without any warranty, express or implied. All opinions expressed on this site are those of the author and may contain errors or omissions. The author may or may not have a position in any company or security mentioned herein. Actions you undertake as a consequence of any analysis, opinion or advertisement on this site are your sole responsibility. Our manual, websites/blogs, author(s), are not an investment advisory service, a registered investment advisor nor a broker-dealer and we do not engage in the business of recommending buying or selling of securities. You understand and acknowledge that there is a very high degree of risk involved in trading securities. The Company and author assume no responsibility or liability for your trading and investment results. It should not be assumed that the methods, techniques, or indicators presented in these products will be guaranteed profitable or that they will not result in losses. Past results of any individual trader or trading system published by the author(s) are not indicative of future returns, and are not indicative of future returns which will be realized by you. In addition, the system, strategies, articles and all other features of Company's product(s) or website are provided for informational and educational purposes only and should not be construed as investment advice. Trading strategies provided are not solicitations to buy or sell securities. Accordingly, you should not rely solely on the author's/company's opinions or strategies in making any investment. Rather, you should use the educational information only as a starting point for doing additional independent research in order to allow you to form your own opinion regarding investments. You should always check with your licensed financial advisor or CPA to determine the suitability of any investment.